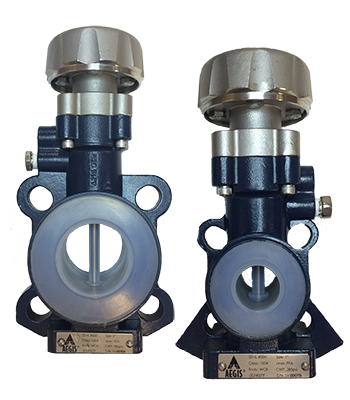 The Aegis® SD-IL Series closed loop in-line sample valve allows for the collection of representative samples of corrosive and toxic process media. Environmentally safe and dead space free samples can safely be taken directly from horizontal or vertical piping. The media constantly flows through the valve and around the conical spindle thus eliminating contamination. Available with septum sealed bottle, hand held bottles, and threaded/vented bottle adapters. Designed to facilitate composite sampling requirements. Available in all alloys, PFA lined and in solid plastic bodies. Available in wafer and flanged body designs.